Care to little, you lose them. Care too much, you get hurt. Geeheehe. I like him. I'm going to make him my cat. What a troublesome Guild. When we get back you better buy me all the metal I can eat. 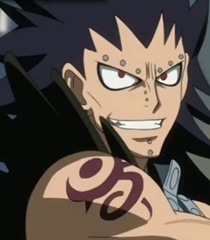 You want war... with Fairy Tail? I'm not the same... as before... I'll make you feel the same. Don't look down on Fairy Tail! Keeheehe. I like him. I'm going to make him my cat.